This book is an introduction to some of the concepts that we work with at Mystic Bodyworks, we hope this will help jump-start your Fitness For Being. 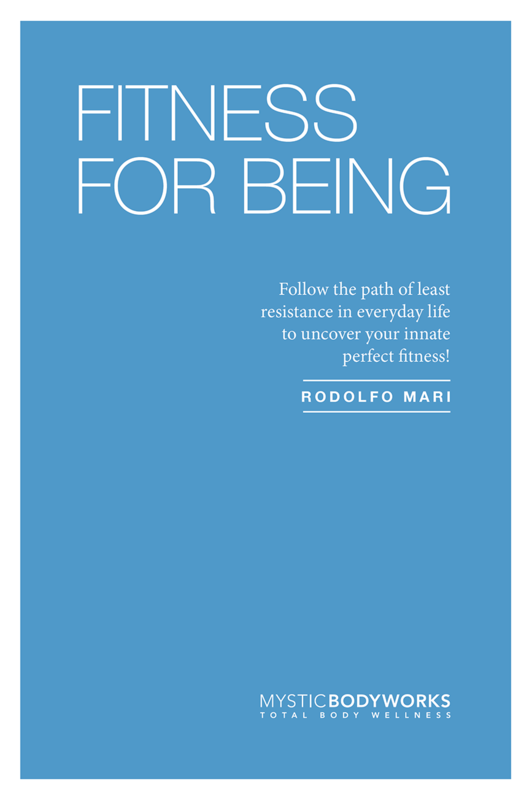 Read through the whole book and see if you can get an overall sense of what we mean by practicing Fitness For Being every moment of every day. It’s not hard at all! The secret is to work from the inside out. Just click on the GET FITNESS FOR BEING link below to download our free book and learn how to reach your own natural physical perfection. Fill out your name and email (please make sure your email address is correct). We will be sure to keep you up to date with any new editions of Fitness For Being. You will also be subscribed to our monthly newsletter (don’t worry we will not fill up your inbox and we would never give out your email to anyone). Rodolfo Mari is the owner and founder of Mystic Bodyworks, a personal training, massage therapy, yoga and pilates studio located in Mystic CT.
Rodolfo has a unique and insightful way of seeing into the human body that has allowed him to help hundreds of people. From elite athletes, to wounded weekend warriors, seniors and children, Rodolfo has helped all kinds of people improve fitness, increase performance, rehab injuries and reach new levels of optimal wellbeing. While in college at Parsons School of Design, Rodolfo began to formally train his eyes and hands to see and sense the human anatomy. He studied anatomy, figure drawing, sculpture and ultimately his passion for seeing with a camera gave him a unique understanding and ability to see beneath the surface that he would later apply to helping people evolve their fitness, improve biomechanics, and resolve injuries. Early on, as a personal trainer, Rodolfo developed a way of fitness that emphasizes how the body naturally moves and flows. After in-depth study of Yoga, Pilates, Massage Therapy, Craniosacral Therapy, Feldenkrais Method, and many other forms of therapy and movement, Rodolfo confirmed his original way of training the body and evolved it into the practice of Mystic Bodyworks. Rodolfo Mari is a licensed massage therapist, certified personal trainer, registered Yoga teacher, master Pilates trainer and an advanced certified Craniosacral Therapist.